We did this trip from the 29 June to 2 July 2018. When researching for the trip I couldn't find a comprehensive report for this section so have been motivated to file this. There are numerous postings that talk about parts of the trip. We used White Squall for the shuttle and the cost was $282.50 after tax. It was a one hour drive from the White Squall Paddling Centre to Bennetts Bay on Wahwashkesh. Hermione and I put the sprayskirt on and headed out into the lake before stopping for lunch at a quieter spot. We paddled around to the MNR weir/dam and did the 50 metre portage on the right. It is steep at the end. We climbed down holding onto the tree roots. After launching we ran a 100m C1 out to the pond below the weir. It is less than a kilometre to where the river splits around an island. We ran to the left in a short C1 and pulled in at the bottom of the island. There is a good small campsite on top of the island which is where we stayed. There are a couple of trails from the upstream side of the island if you want to reduce the height you haul your gear. On Day 2 we were on the water at 10.15 and started by running a shallow C2 to the right of the next island. This leads into another C2. There is then a pause before the main section of Canal Rapids. We were able to run all of the drops. We stopped to scout two of them and for one we were glad to have a skirt as the bow plunged down into the hole. It took 45 minutes to get to the bottom of Canal Rapids. We continued on around the corner to Graves Rapids which is a simple C2. That dropped us into Trout Lake which is long and narrow. We reached our campsite at Mountain Chutes at 3.10. After setting up the camp we paddled over to the portage trail on the right which goes up a high hill. From the trail we decided that the rapid was unrunnable for us. After getting back to camp Hermione reminded me that the trip reports we had talked about a trail on the left. We explored that and found that it is fairly level and only 150 metres long. We got a better start on day 3, getting underway at 9.00. We portaged to the left of Mountain Chutes. Stovepipe Rapids comes next and is a simple C2. As we entered the main part of Island Lake we saw two crosses on an island. We went ashore but couldn't read anything on them. At Three Snie Rapids we portaged 190 metres on the left. We continued to the next falls where there is a 100m on the right. We simply carried 25m over the rocks and stopped for lunch. Within sight of that is McDonald Rapids where we lined the canoe down on the left. At the top of Railway Rapid there is a portage sign for a portage route that includes bypassing Thirty Dollar Rapids. We paddled down to the bridge and scouted from the left shore. We decided to run the right channel but I miscalculated and hit the rocky shoreline. As the canoe pivoted it capsized and we floated down the C2. We pulled the canoe up onto a rock in the pool below and emptied out. It was short paddle to a falls which we portaged 200m on the right over the rocks. Around the corner is the start of another section of portage trail on the left. We walked the trail to scout and then ran the C2 down to a bay on the left above a second falls. It is a steep clamber up the bank to the trail which we followed for about 500m before putting in again to run the lower section. It also is C2 apart from the last drop which is a simple C3 where we were glad to have the skirt on. Nice run though. We camped shortly after that at a large site on the left, arriving at 5.00. On Day 4 we got on the water again at 9.00. Around the corner from the campsite is Farmer Rapids which was just a swift. Six and a half km downstream is a falls with a 200m portage on the left. We took out in a small sandy bay but it could be shortened by 25m by taking out on the rock around the corner. It is then one km to the next rapid where we portaged 100m on the right. I only carried the canoe for the top half of the portage, pushed through the bushes and ran the lower C2. After another kilometre we portaged the gear 200m on the left. I paddled the canoe to a large rock in the middle, slid it 10m over the rock and ran the lower part of the rapid. We passed under the Hwy 400 about 2.30. We continued along Bying Inlet to Ice Cream on the Rocks which we reached at 4.00. There was a strong headwind as we battled up Bying Inlet. Parking at Ice Cream on the Rocks is $10 per day so $40 for us. If we were to do it again I would take out at the trailer park just after the highway. Total distance for us was 49km. The water level over the Wahwaskesh weir was 6" at the start of the trip and it dropped to 4". The recorded flow at Britt dropped from 13cms to 10cms during out trip. I would rate ourselves as intermediate level paddlers using a royalex canoe with a sprayskirt. Take all this into consideration when making your decisions. Thanks to Shawn Hodgins for the use of two trip reports, Kevin Callan for his Magnetawan River Loop route, Stajanleafs for his map of Thirty Dollar Rapids and Jim Baird for his article on spring paddling runs. Thanks for sharing, sounds like a great trip. Any fishing or wildlife? We are vegetarian so we didn't do any fishing on the trip. On the last day we saw a bear crossing the river as we got to the end of a portage. We had been going to have lunch there but carried on down the river for another kilometre. On the last night we had a good display of several Fireflies. We left the fly off the tent and one was landing on the poles. Thanks Robin, always good to know about ways access to GB. You didn't happen to record GPS tracks, did you? Sorry I'm not techie enough for that. I just look at the map and go with the flow down the river. Are you describing Canal rapids in your second para? The short answer is yes. 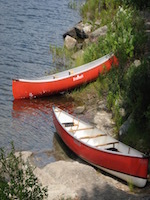 The portage around Canal Rapids starts in Deep Bay which is to the north of the weir on Wahwashkesh Lake. It is 2285 metres long and can get you to the bottom of Grave Rapids. I had wanted to avoid the portage but couldn't get a clear understanding in online information as whether or not we would be able to get through. It wasn't until a week before the trip when I asked a friend for information that I got trip reports from trips that had been through at similar water levels, so I figured we could run the rapids. There were warnings about it being a canyon with no easy way out, which it is. I guess I would have done the route thru Kashegaba and Whites, but I have not done much WW at all.